What about whataboutism? It’s not a simple club to hit others with. It has become equally popular to use whataboutism in defense of one’s own errors as to attack those who do. But the concept is not one-dimensional; it’s use can be motivated under some circumstances. The moral implications of the crimes my country commits are not affected in any way by whatever crimes other countries are guilty of. Thus “what about the crimes of others” has no moral legitimacy. The other way around though, the question becomes more interesting. So when our media and politicians excel in condemnations of other governments, the question “what about our own crimes” is not just legitimate, its compulsory for everybody who wants to have “a moral leg to stand on”. Clearly, a government who has ordered (and ignored) the killing of thousands cannot condemn some other government for murdering a dozen. It must first rectify its own misdeeds. That’s not to say that atrocities can’t be discussed and even compared. Some murderous regimes are certainly worse than others. Mechanism that foster militarism is definitely important to discuss, regardless of whom it concerns. And there are naturally many other aspects of violence in the world that should be penetrated and analyzed. But one thing is self-evidently impossible: I cannot morally condemn others for the same crime a committed myself. This entry was posted in Atrocities, Moral on May 17, 2018 by larsschaff. â€œRussiaâ€™s Emergencies Ministry has dispatched the 52nd truck convoy with humanitarian aid to Donbassâ€ reports RT.com. â€œSince August 2014, Russia has sent 51 convoys with 61,000 tons of humanitarian aid to Donbass.â€ According to the ministryâ€™s press service the 52nd delivery consist largely of â€œfoodstuffs, daily essentials, medicines, firefighting equipment, and art and educational booksâ€. These kinds of news will never appear in Swedish media, of course. (I suppose our MSM would rather describe them as examples of the Russian â€œinformation warâ€ which perpetually obsess them). The only convoy of interest was the first one, as we remember. It was made an object of suspicion: â€œRussian tricks to smuggle weapons and contrabandâ€, or ridicule: â€œsome of the trucks are emptyâ€. After a long time waiting for permits from Kiev to cross the border – permits that never came – the first convoy just took off to its destinations and unloaded. That was the last we heard from these humanitarian expeditions in our media. The New York Times though â€“ a few convoys later – had an informative article about the living conditions in eastern Donbass in which the reporter interviewed a restaurant owner who testified that these deliveries of basic means of existence were essential for life in the haunted region. There is no need to regard the Russian government as more altruistic then other governments to be able to explain these relief operations. They simply help people of Russian heritage or affinity in need. The urge to help may (or may not) be enhanced by the Kremlin refusal to fulfill the deepest wishes of these people, namely to join their spiritual motherland. In fact, Russia helps citizens in a foreign country, moreover a country before whom Russia (even in a resolution to the United Nations Security Council) has pledged to respect and protect its independence and sovereignty (with Crimea as an exclusive exception). The despicable Putin is determined that people in all of Donbass shall stay Ukrainian citizens forever. What Kremlin supports is simply that some degree of self-determination be granted people there. Kiev on the other hand obviously sees the inhabitants in rebel held parts of Ukraine as enemies suitable to kill with artillery shells. Consequently, those Ukrainians donâ€™t qualify for humanitarian aid from Kiev, instead they suffer elimination of their economic rights, such as pensions and other allowances. This doesnâ€™t fit well with western propaganda. Russia is presumed to occupy eastern Donbass and wage a war against Ukraine, supposedly with the intention to conquer the entire country. Thatâ€™s anyway what the leaders in Kiev repeatedly have claimed, supported by western media. In order to uphold that distorted view it is necessary to disregard and keep behind a smokescreen everything substantial of what Moscow says and does. Itâ€™s self-evident that states and governments are no moral agents; they can say and do whatever they have the power to do and say. The Russian government is no exception. But governmentâ€™s statements and actions can and should be constantly scrutinized by their citizens, and their possible lies and wrong-doings revealed. As mere citizens we should also comply with the principle of moral universalism, which states that we must follow the same standards as we apply to others. We should hence as Swedes meticulously dissect our own propaganda before we accuse others of the same misconduct. This principle is violated to a level of absurdity by media in my country; themselves distorting facts and serving half-lies and pure lies without discrimination, aggressively accuse Russia of waging an â€œinformation warâ€. One of the â€œstate controlledâ€ outlets for this Russian propaganda is said to be RT, the most visited TV news channel on YouTube. Vilifying RT may sooner or later prove to be an own goal as more and more people take part of the media market unconstrained by our usual, self-censored media. If anything, the accusations may lure people to watch the defamed â€œpropaganda channelsâ€ themselves, if not for other reason than pure curiosity. Those who look up RT.com to check for the propaganda will find a bunch of citizens from western countries â€“ US, Britain, Irland etcetera â€“ presenting news and writing editorials in impeccable English. One needs to look hard to find any genuine Russians. The selection of news is naturally focused on Russia, but RT also digs up other events that we seldom hear anything of. Thus we can in RT read about inconvenient demonstrations and embarrassing statements (like for instance this one: â€œWWII happened because Russia attacked Germany, and that must be prevented from happening againâ€ /paraphrase/, uttered by Yatsenyuk during his visit to Merkel) which are more or less suppressed by western media. We are back to one of the simplest truisms among definitions: â€œPropaganda isÂ the other guy’s lies, not mine”. This entry was posted in Crimea, Dagens Nyheter, Moral, MSM, Propaganda, Russia, Ukraine on May 31, 2016 by larsschaff. In the early 1980’s, on a holiday trip to Crete in the Mediterranean Sea, I happened to visit a remote village where I passed a small shop selling Greek sandals. The shop-keeper asked if I were a Swedish tourist. When I admitted to that he became exhilarated and urged me to enter his shop. There he pointed joyfully at an enlarged photo in a frame on the wall. The picture showed him and his wife, together with the former (and later upcoming) Swedish Prime Minister Olof Palme and his wife Lisbeth outside his shop. My first thought was that the man was lucky I wasnâ€™t from Swedish upper classes or reactionary circles, in which case he had run the risk of getting a bucket of cold water poured over him. The second thought was: how many foreign politicians would have been recognized at all in a small Cretan village by an ordinary Greek? Today 30 years have passed since Olof Palme was shot point-blank on a street a late evening in a winter-cold Stockholm, when he was walking home with his wife after watching a movie (and giving his bodyguards the evening off). Nobody has been found guilty of the murder. On the occasion of this commemoration our print media, which is predominantly corporate owned, have dutifully and critically evaluated Palmeâ€™s person and politics. Parts of his many important contributions, which they almost mandatory omits, are the ones on the international arena. Itâ€™s easy to understand this omission since he in that context appears as the compassionate politician and moral role model he indeed was. A reader of ordinary Swedish papers must in fact have difficulties understanding how Palme at all reached his international fame; what made cities around the world name streets after him and a low-educated Greek take a selfie with him. Our well behaved journalists have not been keen to report how Palme reached this status by actively standing on the side of the poor, of the oppressed, of people fighting for their freedom and independence, of people suffering under communist dictatorship; in short by being a true progressive in word and deed. Olof Palmeâ€™s harsh opposition to the U.S. wars in Indochina is both admired and infamous and lead to a unique breaking of diplomatic relations between our countries. Sweden opened its borders to young Americans who hated those wars and couldn’t dream ofÂ participating in them. We protected those men in blatant conflict with the superpower (something we nowadays cannot promise a freedom-of- speech-hero such as Julian Assange). Sweden had since the 1960s supported liberation movements also in Namibia,Â Rhodesia,Â Angola,Â MozambiqueÂ and Guinea-Bissau, continuing under Palme, who also strongly acted against the dictatorships in Spain and Greece. Worth to mention is his deep criticism of Soviet atrocities, for example those in Czechoslovakia in 1968. There is a lot more to say about Palmeâ€™s contributions, such as his struggle for a world free of nuclear weapons, his support for Palestine, his participation in peace negotiations and on and on. He was industrious and energetic, also on the domestic field. Iâ€™ll spare the reader details on that front, other than to say that fundamental and vastly important building blocks in the Swedish welfare construction, still very much in place, were realized on his watch. Then, what do we learn from our mainstream media in connection with this day of sadness, when we commemorate the death of a political giant and a profoundly compassionate individual? 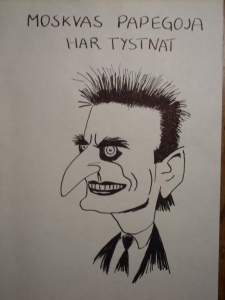 Well, our main paper â€“ Dagens Nyheter â€“ had a lead article by the editorial board last Friday, supposedly issuing its principled view on Olof Palme. And what did we read there? First of all, not a word on Palmeâ€™s real achievements, only about his â€œunreasonably aggressiveâ€ style in debates, his â€œpoisonous rhetoric remarksâ€, his ability to â€œarouse strong feelingsâ€, to â€œinspire people â€“ or drive them insaneâ€, and other profound editorial insights of the same sort. This was perhaps to be swallowed, were it not for two reasons. One: These remarks, obviously not intended to embellish Palmeâ€™s memory, have been perpetually reiterated ad infinutum through the years by our corporate media (covering 80 percent of the printed media). There is hardly a new word in this DN editorial, its main theme has been printed innumerable times and the readers know it by heart. The second reason would have been that even an enemy is expected to show some respect on a day of mourning. But such attitudes of decency are not required in the case of Olof Palme. There is one more thing to mention about Palme, something that distinguishes him from every other person in his country. No one has been so openly and shamelessly persecuted, vilified and despised â€“ ever. The most horrible rumors were spread: Palme was mentally ill, he was a drug addict, a KGB agent and whatever. The day after the murder the Swedish people suddenly got to see some normal portraits of Palme in their papers, such as the one below, and probably hardly recognized him. All of this is nothing to be surprised about. Itâ€™s just the class war in which the ruling classes are merciless, and for the moment have the upper hand (and have had so for the last 30-40 years). 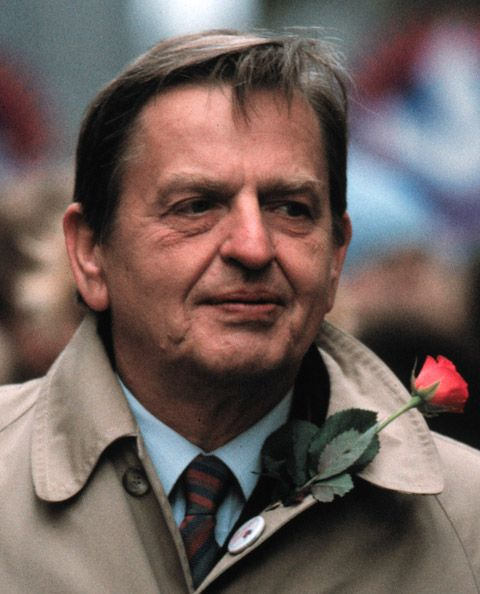 We just have to keep on struggling, and in that we may look to Olof Palme and many others for inspiration. This entry was posted in Dagens Nyheter, Mandela, Moral, Palme, Sweden, USA on February 28, 2016 by larsschaff.